Switching from a house to road life can be quite a change. You will soon realize what you have been taking for granted everyday. Whether its keeping the house clean, finding a place to sleep, or trying to figure out how to earn a few bucks. Just about everything on the road gets turned into a harder job than what it was before. Now, all rigs vary in many different ways and everyone has their own opinions on what they think is the best gear to travel with due to space, cost, & durability. Spare parts, cooking & hiking supplies, & for the bros, a surfboard. Yeah yeah we got it, some obvious things. But what is truly going to make your life easier on the road while traveling for long periods of time, while working on the road, & traveling through different countries? It might be some advanced technology or an everyday item from your home but chances are it won’t be obvious unless you have already traveled like this before. We’ve gathered our top 5 appliances that help keep this work & beast of a truck going. This list is geared more toward the big rig crowd as some of the items do take up a fair bit of space. Internet is key for our traveling as well as our work. Today there are many different ways of getting internet while on the road, whether it be through a phone, modem stick, going into a restaurant, or an internet repeater. We actually use all these methods for our travels but the most ideal is the router system we put in the box. 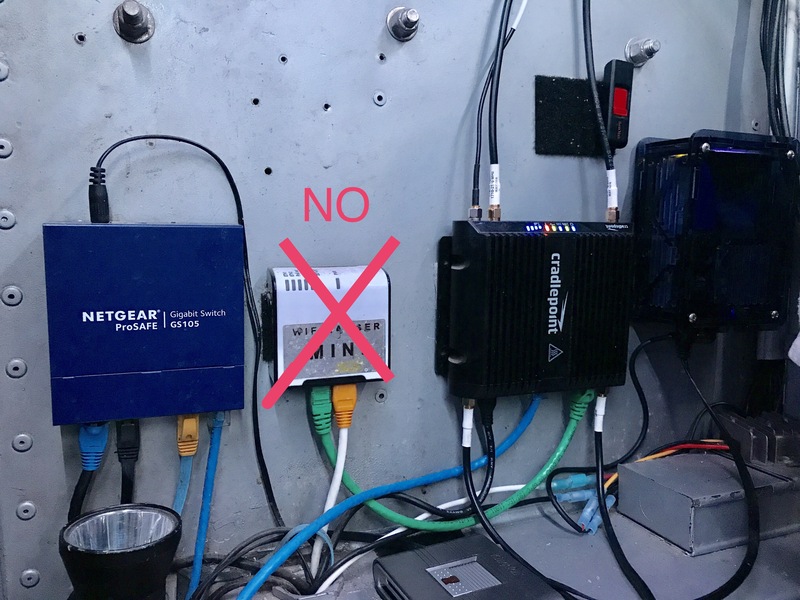 If we are in reach of a Wi-Fi signal outside our box, an antenna on the roof will pick up the signal and deliver Wi-Fi/internet through out all of our devices in the truck. For a modest cost, check out this one, and for a bigger budget and if you have to work, check out this one. The latter allows you to just pop a SIM in from whatever country you are in (or use Project FI $10 per GB anywhere in the world), and off you go, and it also works off a wifi connection. I would avoid WifiRanger, they get a lot of reviews, but I think its mainly from the RV crowd staying at American RV parks. Its a lot different in different countries, with old wifi routers and firmwares. Their gear did not perform well for us at all, and when needed, we found their tech support lacking and ineffective. They also use very cheap hardware and slap a label on it as theirs and it shows in use. It’s just not built tough. We can highly recommend Cradlepoint or PepWave. We often joke about how nice it is to go in the back and snack on some ice cream after a long hot day of driving. That is truly lovely. But beyond the bourgeois idea of whipping out ice cream from the truck, the freezer is a great storage locker of meats. Great meat can be tough to come across in other countries and with a freezer you can stock up on the good stuff. Normally we will find a rather nice grocery store and buy all sorts of meats in large quantities. Take it back to the truck and break up the meats into small portion Ziploc bags before freezing. This works like a charm and you can count on us to always be ready to BBQ at the camp spot. We use a Arb Fridge Freezer for this. We have this one, and we love it. I know this isn’t for everyone as you do need a larger vehicle but damn our washer machine has been so convenient. As we were building MogTug we were pondering in the workshop of some of the most ridiculous things we could add on the Mog. Dishwasher system, separate ice maker, built in outdoor grill, etc. Once a washer machine was brought up, we were reminded how terrible it was trying to have clothes washed in Europe. Friends would always ask to take our laundry, our work partners, and the typical coin Laundromats were pretty scarce around Europe. We are building this vehicle; how hard could it really be to put our own RV washer/dryer machine in the truck? Probably one of the easier systems we put in the Mog. No more wasting time trying to find someone else to sort my dirty clothes and no more showing up to work with out clean clothes. Our particular unit, has a condenser dryer which didn’t require a big dryer vent hole on the side of the truck. You can check it out here, but they also sell it with a traditional heat based dryer here. This thing has been TOUGH, and we can highly recommend it. With a larger vehicle comes actually floor space and while traveling around you are bound to hit all the elements. Living in such a small space can be tough and it can feel dirtier a lot quicker. From the beaches to the mountains, our vacuum gets used a few times a day to keep our floors clean. And then throw two dogs in the mix and you’ll have hair in every nook and cranny. This little Dyson is small and has served us great. You can check it out here on Amazon. Just another “appliance” that a traveler in a small rig or no rig might laugh at you about but it is just so convenient to travel with. From passport copies to scanning translations of Mayan languages, it has never let us down. We receive lots of important documents in each country for the truck, moto’s, dogs, and our selves so the first thing that gets done is copies and scans of all of those. This was another thing that we hated trying to find and learned this could help us and our travel flow. Our printer was cheap, but its bulky. If we were to buy today, we would buy this one. I know we said only 5, but one item that deserves an honorable mention are our Fantastic Fans. We have two of these, and they move a tremendous amount of air without using a ton of power. They are tough as well, as we aren’t nice to them. But they keep working and working, and the company has GREAT customer service, and actually cares about their products. You can check them out here.